Today we will be reviewing over 11 Waterpik tips, which in total are compatible with up to 21 water flossers. I have been receiving emails from people asking “where can I buy waterpik replacement tips?” Well in this article you will not just learn where to buy waterpik replacement tips but also which waterpik attachments you should buy for which model and for what purpose. There comes a time when your waterpik water flosser does not do the job as much as it used to, it also doesn’t look so precious anymore. Basically, everything that used to be cool about it aint cool anymore. Don’t be driven to despair, just yet. The only trouble could be your old, moldy waterpik flosser tips. Solution? Just replace them with one of the new ones below and your teeth will appreciate it! Before rushing for a purchase, you may also be wondering when do you tell if it’s time for tips to be replaced. Here are some signs to help you figure that out! The pressure has suddenly dropped. These little babies has pores on them, with every use they open up and the pores turn into holes. Hence, the pressure is no longer as intense. Noticing some blackish dirt accumulating on your tip? Hard to remove or can’t be cleaned at all? Much like tartar. You don’t want that going inside your mouth, time to replace it! Did you break or crack your current tip? 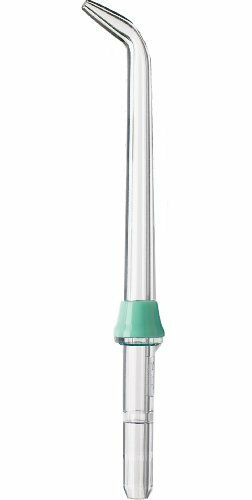 Don’t waste any more time, scroll below and find an appropriate tip for your waterpik water flosser. Does the water dribbles out instead of a strong, steady stream? Replacement is required. Between 3 – 6 months of use, depends on which tip it is. (Check at the end of each tip summary below for replacement time recommendation). Which Waterpik Tip You should buy? Check the table below to see which tip you should buy for your current needs. General Use. More effective than string floss for healthier gums. Implants. Bridges. Crowns. General Use. More effective than string floss for healthier gums, plus added plaque removal in hard to reach areas. Braces. General Use. Up to 3X as effective as string floss for removing plaque around braces. Periodontal Pockets. Furcations. Gently delivers medicament and rinses deep below gum-line. Now that you know when it’s time to replace you tips and which one you should buy, great! Let’s delve into it. Note: Please make sure to check the two products that I recommend at the end of this post. I think you will find them useful if you decide to purchase replacement tips. These are the normal waterpik jet tips for general use. They provide high pressure with that pulsating feeling and cleans between teeth and below the gum line. The waterpik jet tips’ collars are colored differently, which will help members of the family know exactly which one is theirs. No more guessing and no more germ sharing. It is recommended you replace these tips every 6 months. 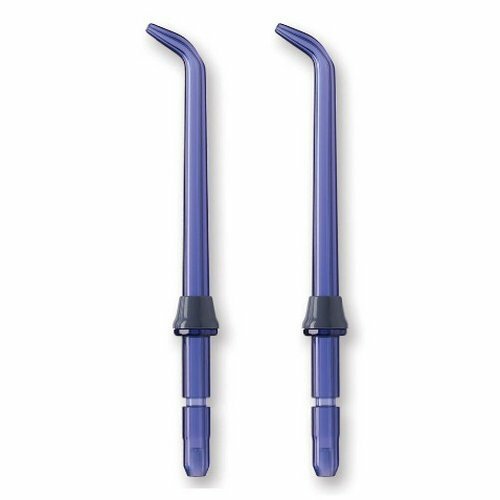 The Waterpik pik pocket tips are meant for periodontal pockets and furcation. These tips are made of soft rubber for a gentle low pressure delivery. The Waterpik Pik Pocket is the tip you’d want to use with mouth washers as its pressure is not intense. Just like the high pressure jet tip, the pack of 2 conveniently come in different colors. Does not work with older models. Looking for tips for older Waterpik models? Scroll more down. It is recommended you replace these tips every 3 months. A new design of the Plaque Seeker tip meant to give you all the benefits of pulsating water and more! This tip is meant for crowns, implants, bridges and other restorations. It spots three thin bunch of bristles (tufts) for easy access on stubborn plaque around crowns, veneers etc. These are low pressure Waterpik 360 replacement tips designed for use on the sensitive areas of your mouth such as when you have gum inflammation. They are also a best choice for children, as children normally frown upon the high pressure of the Water flosser. The low pressure will also help them get the tip as close as possible when cleaning without hurting their delicate gums. These tips are kind of fragile, so if you go on and buy for kids, buy a couple more just to be on the safe side. They are also colored differently, but you may notice it on the image. Note: These are LOW PRESSURE tips, so the stream will be very weak for most people. If you’re looking for high pressure tips for your Waterpik 360, get the first tips we featured on this list. 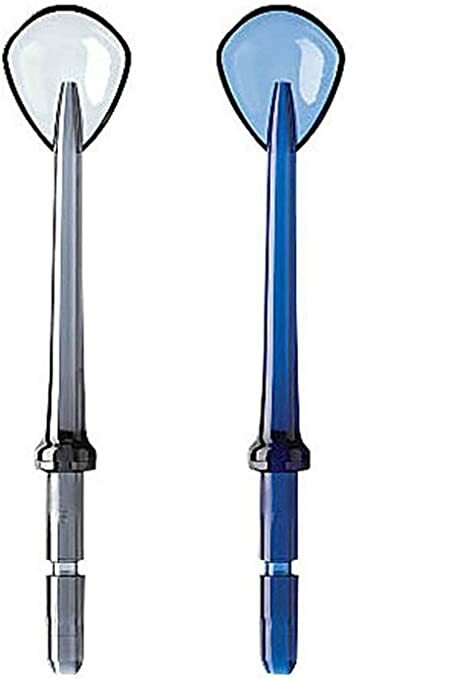 Waterpik 360 replacement tips are not recommended for use with any other Waterpik model. Even though some reviewers on Amazon mentioned that they worked with the WP-100 unit. The 90 degree tip is not manufactured by Waterpik, even though they should have it on their arsenal of tips. 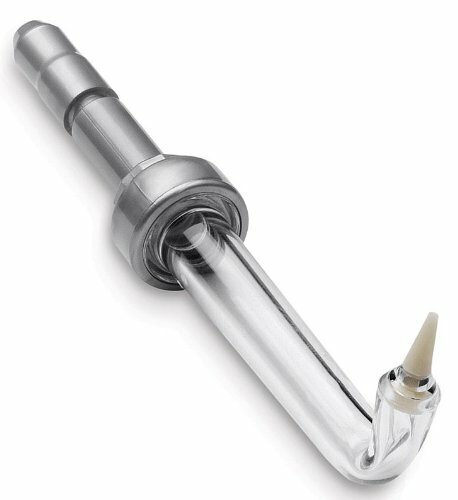 Fortunately, Periogen (the company behind the making of this tip) decided to take a standard high pressure tip, bended it to form a full 90 degree angle. This tip will come useful on places that are hard to reach with standard tips, like behind the rear molars and incisors. Please note: This is not a replacement tip for your standard provided tips, but would make a great addition. The 90 degree bend makes it easy to access hard to reach parts of the mouth. But that does not mean it doesn’t come with few disadvantages. Get clogged quicker than usual. Produce lower pressure than the standard high pressure jet tip. Disturb the flow of the stream. Need to be replaced more often than normal. Despite that, you will find this tip as a big improvement compared to the 45 degree tip when it comes to reaching comers of your mouth. If you own the Periogen tartar removing cream (mentioned above), then you’ll find this tip useful when you need to apply it. It could work with others too. The Waterpik Orthodontic tip helps in cleaning hard to access plaque that is hidden inside and around braces or orthodontic brackets. The end of the tip spots small soft bristles that are gentle for easy access through the braces. This is a must have tip if you wear braces. This is a standard Waterpik tip meant for general use with the waterpik. It is used to clean below the gum line and deep between teeth. The tips are also color coded and works only with older models of water flossers. This tip work like the Pik Pocket tip we reviewed above, except it’s for older waterpik models. 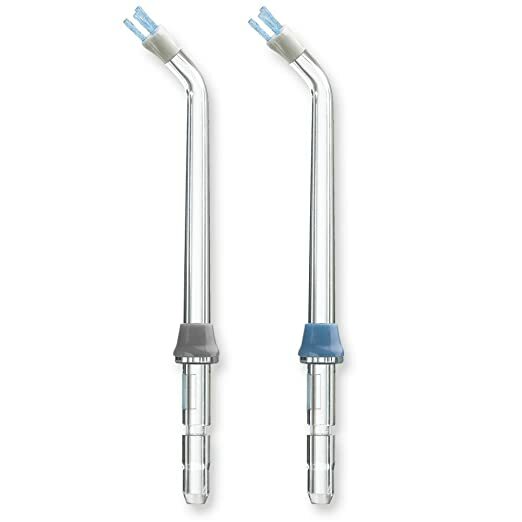 The pressure is lowered so it great for cleaning periodontal pockets and furcation. It can also be used with therapeutic rinses for the gum pockets. This is a standard tip for very old models of waterpik flossers, models that are no longer in production. They are hard to find, so make sure grab as much as you can when you buy them. The FTW-01 Waterpik replacement heads are designed for use with rechargeable waterpiks. Rechargeable waterpiks are an excellent alternative to string flossing and are highly affordable. These replacement tips come in a replacement cartridge that makes changing tips daily a simple and quick process. Just because the Tongue cleaner is listed at very end of this list does not mean it is the least important replacement tip. Actually, scientific studies show that 70% of mouth odor is caused by bacteria on the hard-to-reach area at the back of the tongue. The contoured spoon shape of the waterpik replacement head tongue cleaner traps and removes that bacteria and then uses the pulsating sprays to wet the tongue and sweep it away. So this tip is specifically designed to remove the bacteria that causes bad breath. There’s also an available version of the tongue cleaner which is compatible with older models (WP-72, WP-60, WP-65), you can find it here. 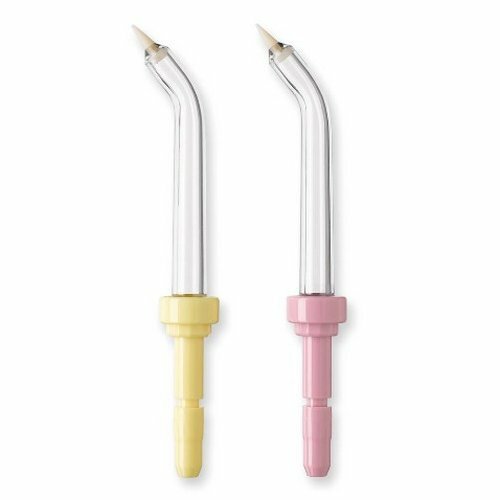 I hope you have found our list of Waterpik replacement tips useful, but before you go away and make a purchase, I’d like to recommend these two products to you. Since you’ve decided to buy replacement tips and that you care so much for your oral hygiene, I am sure you’d find the following products useful. 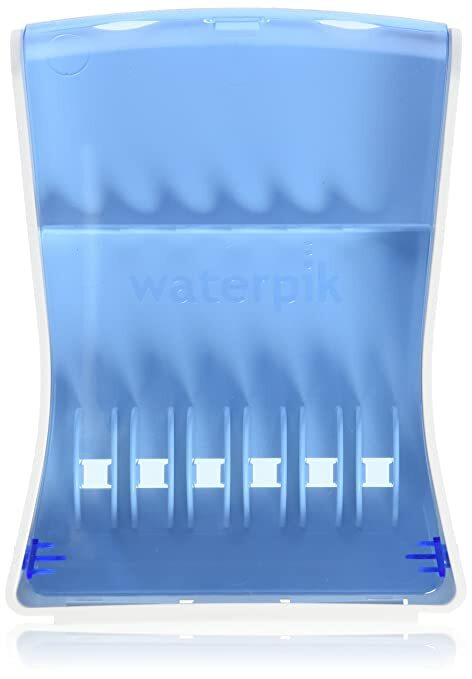 If you’re buying more waterpik replacement heads, then it makes sense that you will also run out of storage. So buying a storage case which is not only convenient but hygienic too is a no brainer! This will also help prevent your tips from falling and breaking. 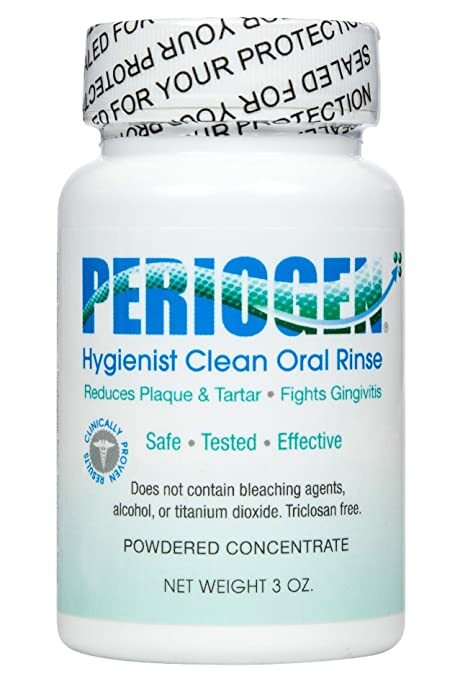 If you’re suffering from stubborn tartar that your waterpik alone cannot remove, then the Periogen Tartar removing oral rinse will come to your rescue. You just apply it before you clean your teeth with a water flosser, it remove tartar build with each application. Most people see results within 6 – 8 weeks, it really depends on the age of tartar. Thank you for reading. Also make sure to check out the best-selling water flossers on the right of your screen.